For the last 10 years, nearly every week of my life, I have spent a half day caring for women with cancer who come to see me with concerns about their sexual function. 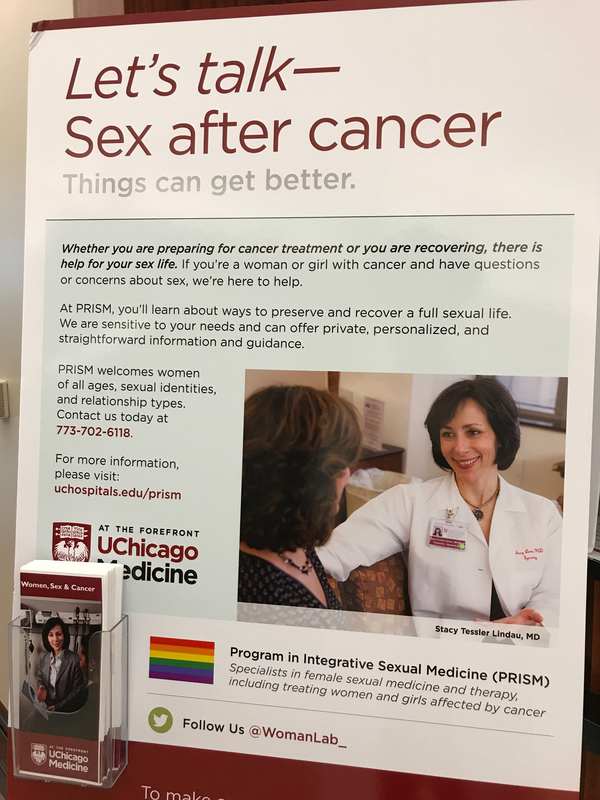 Nearly a third of patients come not because anyone referred them but because they saw a poster in a hallway of the Center for Advanced Medicine or a brochure on the coffee table in the Breast Center at the University of Chicago medical center. About half of my patients come from a doctor or hospital other than the University of Chicago, where I work. Now, I’m a doctor, too, and I am certain of three things about these statements: 1) women aren’t making this stuff up, 2) if someone followed me around with a tape recorder (remember those?) or a 21st century digital recording device I would say plenty of things in the course of my stressful day that I’d wish I could erase, and 3) doctors, as a general rule, are people who want to be helpful. Most doctors don’t go to four years of medical school and another four years of residency training and two or three more years of fellowship and licensing and auditing and compliance and continuing education and early mornings and late nights and working on the weekends with the plan to hurt women. And yet, sometimes we do. We hurt women with the things we say when they muster up the courage to talk to us about their sexual concerns. We hurt women with the things we don’t say because when we don’t talk to women about the sexual function problems they are likely to encounter after cancer and medical treatments for cancer or other conditions then women think they are alone when the problem happens to them. Women think it’s just their problem and they don’t realize they can get help. 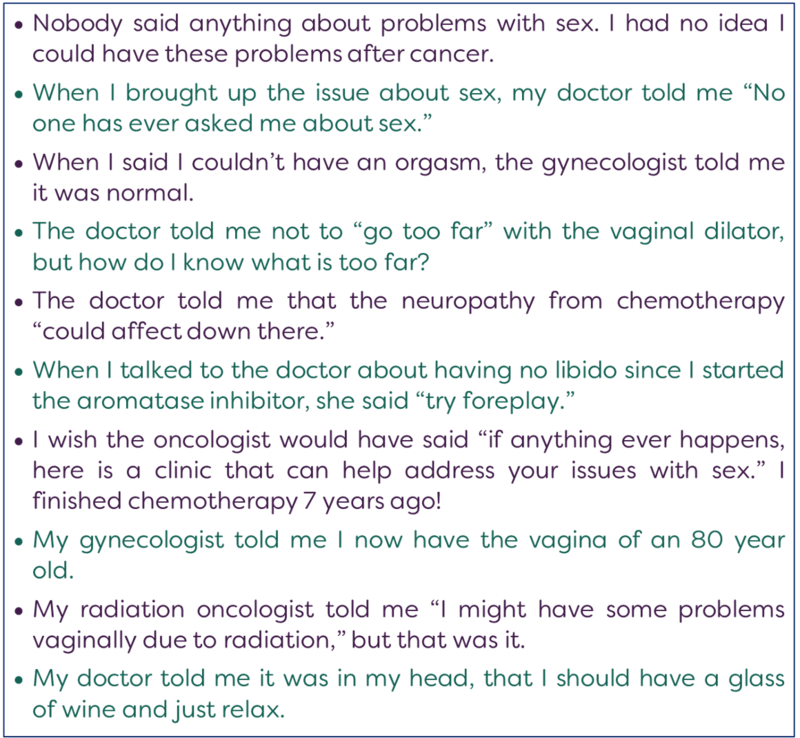 I think most doctors and people in general – male, female or other – can see how ridiculous it would be to talk to a man this way about his sexual function after his prostate cancer treatment. Maybe things used to go down this way, but probably not since 1997 when Republican U.S. Senator Bob Dole, Purple Heart winner, and prostate cancer survivor went on TV during Superbowl XXXIII to promote sildenafil (marketed by Pfizer as Viagra) for the very first time. Female sexual function after cancer hasn’t found her Bob Dole yet, but she will. Could you be the Bob Dole of female sexual function after cancer? If yes, please drop me a line. Until then, WomanLab will keep sharing with you everything we know about what to do (and what not to do) to help preserve and recover female sexual function after cancer.